Movie freaks do you have any trouble keeping track of all the movies you have watched? If you’re your status marks ‘YES’, then, MoviesBook app for Android should be your first pick as it allows you to catalog the entire movie collection with a not many steps. However, what is important is; this application is for managing a movie collection, is not possible to download or watch movies. The title search using archive supplied by TMDb (themoviedb.org) is a free and open database. It is completely open and is led by people like you and now used by millions of people every month, is also used by the centers of the world’s most popular media. MoviesBook Android app interacts with this database to retrieve information about the movie and in seconds you can add any information relevant to a movie. With MoviesBook for Android you can keep a track of movies you have, you have owned or lent or movies you wish to buy, than those already seen or you want to see. You can evaluate the app by downloading MoviesBook for free. But the free version is limited to 30 titles. The full version on MoviesBook app for Android can be downloaded from Google Play Store for $1.49. 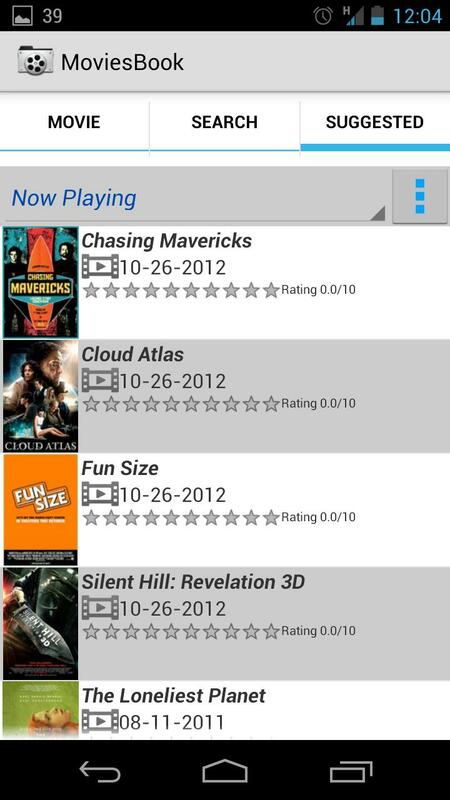 MoviesBook app for Android enables you to add movies manually by title search/ barcode search or by cast member search. Also, you can manage categories (owned/wished), customize with location, notes, evaluation and more. It helps to view details with synopsis, full cast list and display the poster magnified with high definition. Loan titles to your friends and keep track. Its features help you call or send a text message or an email to your friends to remind them to return the movie. In addition to it reminders can be added on your calendar. You can create backups of your movie collection or restore previous backups. It helps to export the movie collection to Excel, ‘in Cloud’ with dropbox. Random selection can be done based on filters applied. There is also a section categorized for recently released movies and recommended movies. The connectivity with SNS is another added advantage for the app. And much more! The MoviesBook app for iPhone is optimized for phones but not for tablet. Never again will you have to buy or rent a movie twice. Download the app and keep track of your movies database.